I am a HUGE fan of curries. Yellow, red, green, any color and I'm about it! I wanted to create a curry that would leave me feeling light and satisfied. The one hits the spot! Ditch the store bought curry paste and make this one in under 5 minutes. You can make this entire dish in the time it takes your rice to cook.. which is a freakin’ miracle come Monday night. I guarantee you've never tasted a “curry” this fresh and bright. 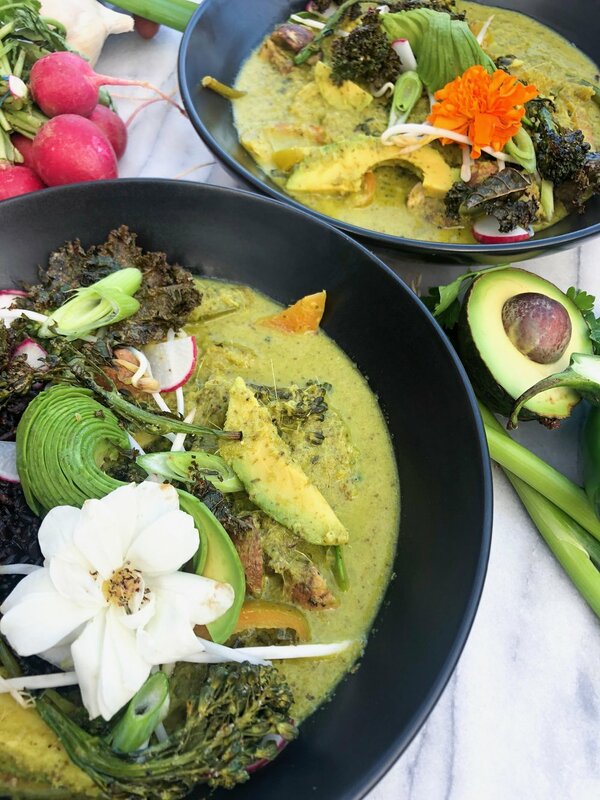 Tangy Avocado Curry, in 35 minutes, for under $12. Boom. Add all ingredients to the food processor or high powdered blender and process until you've got a smooth consistency. It'll be a lil stringy from the ginger and thats ok! Dump ingredients into a bowl and set aside. You can make this a few days ahead of time if you want! Make 2 cups black wild rice according to package. In a large sauté' pan, while your rice is cookin', melt coconut oil over medium heat. Add onion and cook until translucent. Add curry paste and cook for about a minute while stirring. Add in broccoli, bell peppers, and mushrooms. Stir for about another minute. Add coconut milk, stir, and let simmer for 5 minutes. Add in 2 of the avocados, and stir gently. Check for salt + pepper. Add your rice into a bowl, pour the curry on top. Top this guy with a 1/4 avocado, radish slices, green onion, bamboo shoots… whatever your lil’ heart desires! Enjoy with friends or use this recipe as a great plant based meal prep!